SHINE provides information and assistance through unbiased counseling and outreach on Medicare and other health insurance concerns. SHINE services are provided free of charge through volunteers of the Florida Department of Elder Affairs. Everyday, with the help of SHINE, elders are empowered to make informed health coverage decisions and resolve insurance problems. Beneficiary Services Award from the Centers for Medicare & Medicaid Services. 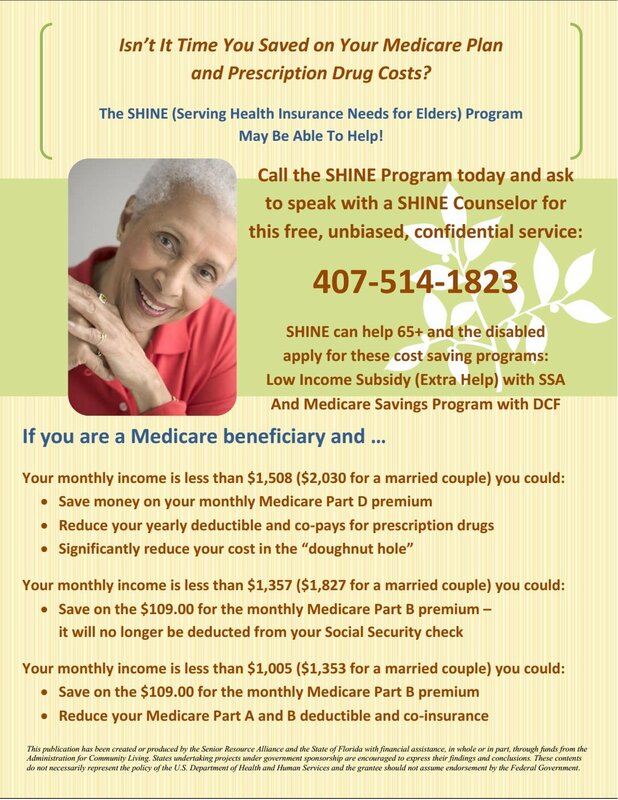 SHINE is funded by the Centers for Medicare & Medicaid Services and is administered by the Florida Department of Elder Affairs. Senior Resource Alliance, Central Florida’s agency on aging, provides support for SHINE in Brevard, Orange, Osceola and Seminole counties. For more information about SHINE, call the Florida Elder Helpline at 1-800-963-5337 or visit us on the web at http://www.FloridaSHINE.org/. For more on how to volunteer with SHINE click here. You can meet one-on-one with a SHINE volunteer at local counseling sites, which are listed below. To speak with a SHINE counselor by phone, please call the Florida Elder Helpline at 1-800-963-5337 if you live in Orange, Osceola, Seminole or Brevard counties. Free unbiased counseling is available at the following locations on Medicare, Medigap/HMO, Medicaid, Prescription Drug Plans, and Long-Term Care Insurance. All counseling is first-come, first-served. Please note: Days and times may be subject to change. Please call us for any updates. SHINE also provides community education, focusing on Medicare updates, beneficiary rights and consumer protection. Volunteers speak to local groups, community organizations and employees. You can also find SHINE volunteers at community health fairs, both large and small, distributing information and answering questions about Medicare and other health insurance concerns.